I think that those of us on different sides of this debate disagree less than some people realize. Mostly, we seem to see the responsibilities and rights of a museum differently. What I’ve seen from all this are the difficulties of bringing street art into a museum context. It is important that art history and museums recognize the street art and graffiti movements, but it isn’t easy to do. A show of only work on canvas or screenprints or other “gallery art” clearly wouldn’t be a street art show, but the Tate Modern missed an opportunity by keeping things outdoors. So it seems that the solution would be a show that mixes outdoor projects with a gallery component, like MOCA is planning to do in April. Except that a museum cannot commission street art. They can commission public art by street artists, and there is a difference. Public art, such as that commissioned by MOCA, comes with certain responsibilities and considerations that do not exist in street art. That’s why festivals like FAME, Primary Flight and Nuart are so important. Their focus is on bringing street art and graffiti to an area, and they don’t have the same considerations of museums. A lot of what goes up at FAME still goes up illegally and without anyone’s permission. While museum exhibitions are important for securing street art the place that many people believe it deserves in art history, those mural projects are of at least equal importance for actually bring new street art into the public space. Blu says he was censored. I respect Blu for not bowing to the concerns of working in a museum context and not subjecting himself to “self-censorship,” but public art involves what Blu would term self-censorship. Until Blu’s statement, I had been under the impression, now obviously incorrect, that Blu might be returning to paint another mural for MOCA. That made me feel less upset about his wall getting buffed. Unfortunately, Blu will not be returning. It’s too bad, because as I’ve said before, a mural by him could have been a highlight of MOCA’s street art exhibition, but I respect Blu for sticking to his principles. That doesn’t mean that Deitch was wrong to remove the mural though. It was a difficult decision well but within his rights as a curator and museum director. It is not the decision that I wish he had made and I highly doubt that Deitch took any joy in his decision either, but it may have been the right move for the exhibition and more importantly I can see why it would be the right move for the museum as a whole. The (admittedly imperfect) analogy that I’ve come up with for this situation goes something like this: A curator at MoMA is putting on a show and wants to include a new painting by Murakami. Somehow through some crazy miscommunication with Murakami’s studio, a painting arrives that the curator hates or for whatever reason cannot be included in the exhibition. The curator screwed up. He should have communicated his thoughts more clearly to get something closer to what he wanted to include in the show. What does the curator do? He sends the painting back to Murakami and doesn’t include it in the show. That’s part of his job as curator. Unfortunately at MOCA, that situation played out in public and in the artwork had to be destroyed instead of being sent back. MOCA removed a mural that they had not approved to have painted (they asked Blu to paint a mural, but mistakenly did not approve a specific design beforehand) in the first place. In that sense, I can certainly appreciate the argument that MOCA buffed a piece of street art, and that’s ironic and not desirable. However, a museum is a different context with different concerns. It would be tragic for the break through of a street art /graffiti show at a respected institution like MOCA to be sabotaged by public outcry over perceived antagonism or insensitivity in Blu’s mural. Graffiti is enough of a contentious issue already. The situation is unfortunate but I understand MOCA’s decision. Sometimes I think it is better to take the high road and forfeit a battle but keep pushing to win the war. 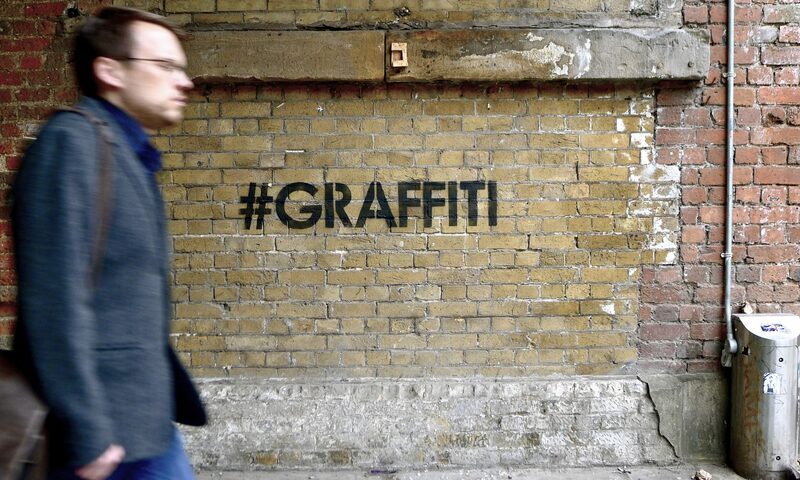 Street art or graffiti purists are welcome to pursue their art on the streets as they always have without censorship. I think that though MOCA wants to honor the cultural impact of the graffiti/street art movement, it only exists in its purist form in the streets from which it arose.